*Please note we close for lunch daily between Noon and 1pm. Cardiac rehab programs focus on exercise, education, counseling and behavior change. Exercise is usually done in a group setting, but is personalized to each patient’s specific need. Education focuses on managing heart disease, meeting dietary goals, understanding self-management, and following a treatment plan. Counseling identifies high-risk behaviors. Behavior change skills help participants adopt low-risk, healthy behaviors. Cardiac rehab programs are crucial for recovery. A program may be started when a heart disease patient is in the hospital and may last from several weeks to several months. The rehab team is made up of nurses, doctors, therapists, dietitians and other specialists. It is important to adhere to instructions, ask questions and report any symptoms. Heart monitoring is always available. Be sure to check with your insurance company before starting a cardiac rehab program to find out what benefits you have. 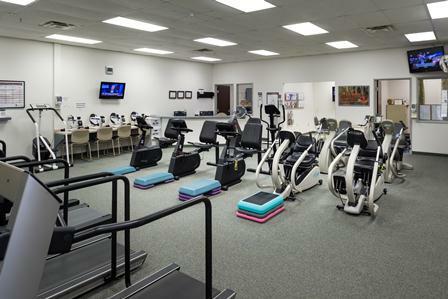 For more information about Fort Loudoun Medical Center’s cardiac rehabilitation or wellness program, contact Fort Loudoun Medical Center Cardiopulmonary Rehabilitation Center at (865) 271-6030.